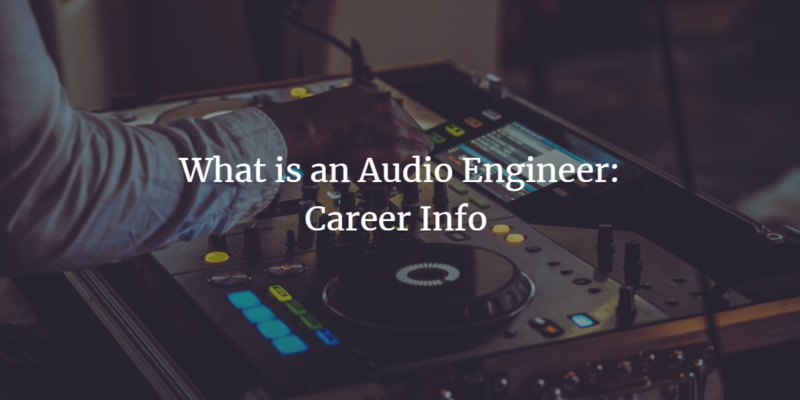 An audio engineer, also known as a sound engineer, works with the mechanics of sound and all technical aspects, such as choosing the right microphone, preamp, and compressor for the job based on the artist and producer’s vision for the project. Recording and mixing are a huge component of an engineer’s role. However, listening and knowing how to listen is the most important. The audio engineer’s job is not simply just to press record, it is to know how to listen to both the sounds and to the artist. It is the engineer’s job to be the conduit for the project and know how to bring the artist’s vision to life. These days the producer and the engineer are one and the same. To elevate your skill-set you need an advanced education. The great thing about an audio engineering education is that it doesn’t end on your last day of school. It continues on throughout your career as you constantly grow and evolve. An audio engineer might perform tasks like adding effects, auto-tuning, and editing tracks together in Pro Tools. While an audio engineer’s role may vary between producer and engineer, it is not uncommon for them to become a part of the creative process with the artist. Studio Engineers: Primarily work in recording studios with artists and producers. Assistant Engineers: Apprentices who often assist the lead engineer in a recording studio. Recording Engineers: Specialize in all technical aspects of recording and mixing sound. Game & Audio Design Engineers: Specialize in sound design for video games, game engines, and working with the development team. Mix Engineers: Specialize in blending and balancing all tracks from a recording session to make one cohesive vision for an artist or label. Mastering Engineers: Specialize in enhancing a mixed song for commercial delivery to the public. Live Sound Engineers: Specialize in ensuring the sound quality for live events. Monitor Engineers: Specialize in helping live performers hear themselves. Systems Engineers: Specialize in managing the overall sound at live events and coordinating the other engineers. Audio Post Engineers: Specialize in editing audio for movies and television shows. What is the Audio Engineering Workplace Like? The location where an audio engineer works is mostly dependant on their particular specialty. Common workplaces include commercial recording studios, home recording studios, film/television studios, theaters and live venues. Having a higher education will be beneficial for those looking to work in the industry. It’s possible to get bachelor’s degrees, associate’s degrees, and vocational certificates in audio engineering. But, with bachelor’s and associate’s degrees you have to take prerequisite courses such as math and English again. The advantage of a certificate program is that it is laser focused on the field that you are interested in. Audio engineers are generally independent contractors, so consequently, building network connections are critical for any audio engineer. Audio engineers are needed for music, television, radio, film, sporting events, concerts, plays, and more. Thus, there will always be a demand for someone with the technical knowledge of an audio engineer. In larger urban areas, the positions available for audio engineers can be more lucrative due to higher profile clientele. For example, New York, LA, Nashville and Seattle are all large markets for audio engineers. It is important to note that as an audio engineer you can find work all over the world and it is equally as important to be open to the opportunities that come your way.